It's mid-March and I'm looking out to icicles dripping from my roof and the sounds of the neighbor kids having a snow ball fight on their snow day. Signs of spring have been showing themselves--I've spotted crocuses about town, rhubarb is claiming its place at grocery stores and farmers' markets, and spring cookbook review copies have started to appear on my doorstep-- but they've so far been slow and sparse. We had so much fun working on our Design*Sponge piece that Morgan and Elizabeth and I vowed to do more collaborations. All feeling the onslaught of the cold, we wanted to do something floral and springy, that might inspire daffodils and bike rides and short sleeves, if only in our minds. 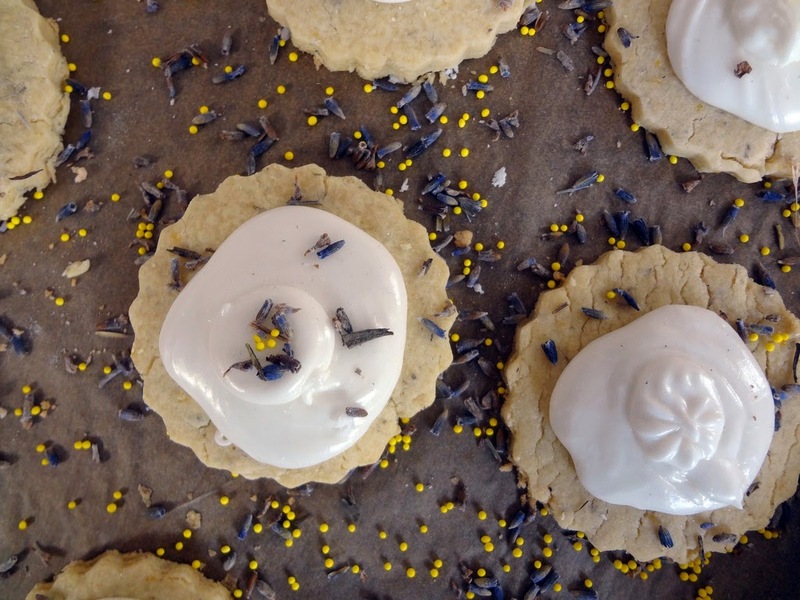 I've been keen on lavender-lemon combinations, and a recipe for Tiny Lemon Meringue Pie Cookies from April Carter's beautiful book trEATs: Delicious Food Gifts To Make At Home (more on the book soon) had recently caught my eye. 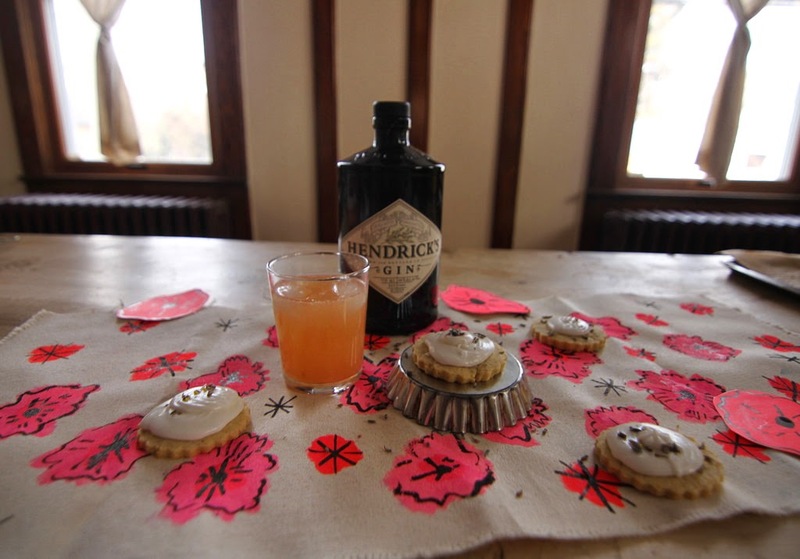 Morgan added a cocktail of Hendrick's gin, grapefruit juice, and rosewater, which we dubbed The Petal Pusher, and Elizabeth contributed a bright and sunny handpainted table runner. What could beckon spring better than that trio? 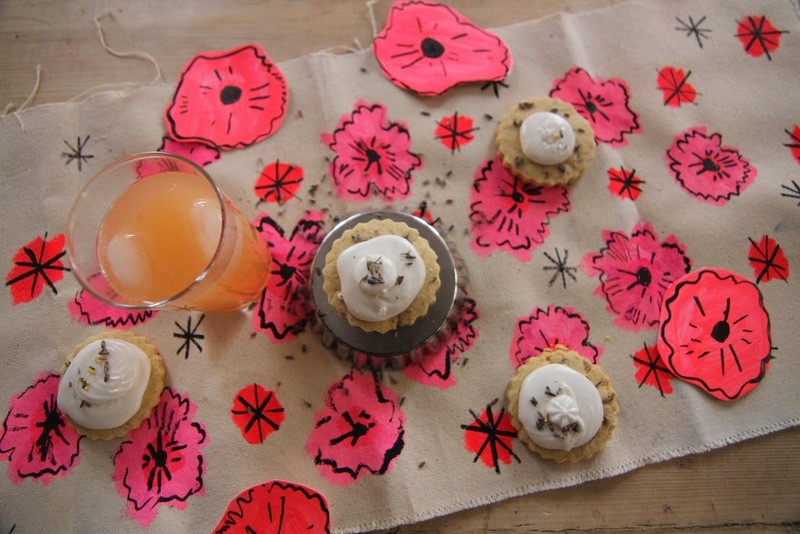 For The Petal Pusher recipe, visit Morgan's Panda Head Blog here and to learn how to make your own hand painted table runner, check out the tutorial on Elizabeth's tumblr. For the cookie recipe, read on! I adapted April Carter's recipe by making the cookies a little bigger (mostly because I didn't have a smaller cookie cutter) and adding lavender buds to the dough. April calls for using Instant Royal Icing Sugar, which I had to go to a specialty cake shop to get, but you could also just make it from scratch. I didn't make my icing stiff enough to begin with, which is why the icing is a little more globby than "meringue peaked," but it still tasted good! 1. Preheat the oven to 340 degrees F and line 2 baking trays with parchment paper. 2. In the bowl of a stand mixer fitted with the beater attachment, mix the butter and sugar until the mixture pale and fluffy. Add the yolks and mix well to combine, then add the lemon zest. 3. In another medium-size bowl, sift the flour, baking powder, and salt and stir to combine. Gradually add the flower mixture to the butter mixture, mixing until just combined. With the mixer on the lowest speed, add the lavender buds until incorporated. 4. Turn the dough out on floured surface parchment paper and knead until smooth (it can be a bit crumbly, so add a little sprinkle of water if it's too dry to work with). Roll out onto the parchment until it is about 1/4 inch thick (you may have to do this in 2 rounds, depending on the size of your surface). Place another sheet of parchment on top of dough, transfer to the baking sheets, and chill in the freezer about 10 minutes. 5. Remove the dough from the freezer and cut into 2'' circles using a fluted biscuit cutter (or cookie cutter of your choice). Transfer to the lined baking sheet and chill in the freezer another 10 minutes before baking. 6. Bake cookies in the oven for 3-5 minutes until firm yet still pale. Let cool to room temperature on a wire rack. 7. Meanwhile prepare the filling. Mix the Instant Royal Icing Sugar (or make your own royal icing from scratch) with the water to form a smooth paste for piping. Transfer the icing to a piping bag fitted with the 1M star icing tip. 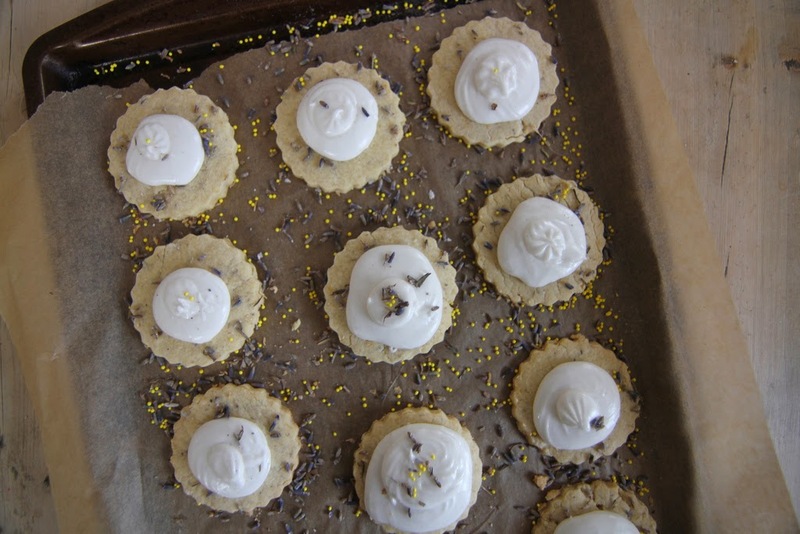 Ice a single peak on each cookie and sprinkle with non pareils and lavender buds to decorate. Allow to set hard before packaging.